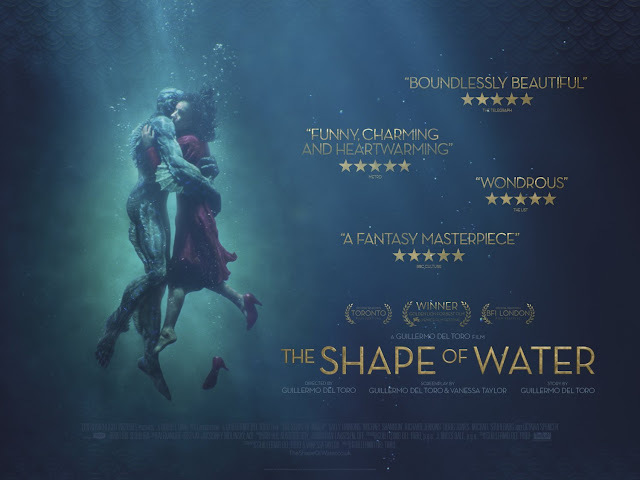 Recently I saw the Shape of Water which is Del Toro's latest masterpiece and has been making the rounds at all of the award shows, picking up a lot of Oscar buzz. I was a little skeptical at first as sometimes you get films which look like they've just been made for the Oscars, but I'm so glad I went to see this film. The Shape of Water stars Sally Hawkins as Elisa, a janitor at a research facility who learns about their new creature that is being held in captivity. It's quite a simple story which allows room for many other areas, and although I feel it did lose the pacing slightly in the second act, the plot is engaging and kept me interested throughout. The main things that got me about the movie was the set design which was absolutely stunning. If you've ever played Bioshock then you'll be able to picture it, however the sets are quite dark, art deco style with lots of greens and black to play with the water. It was honestly breathtaking. I also really liked that you could see Del Toro's passion for filmmaking come alive in this movie. The creature was nearly all make up and costume where possible, as for the effects on set and the actors absolutely come alive under his directing. It was definitely my favourite film I've seen in a long time purely for directing. I felt like Del Toro has opened a door to invite you into his world and it's absolutely mesmerising. I would definitely recommend seeing this film if you love Hollywood, romantic films or just something different.